On New Year’s Day I finally fulfilled a long-held culinary desire: to roast a goose over the festive period. Every year when I watch ‘A Christmas Carol’ or read another wonderful sounding recipe for goose I think I’d love to cook one, but I just can’t bring myself to discard the turkey which I’ve eaten every year for Christmas lunch my whole life. But this year I thought I’d push the boat out and order not only a turkey from my butcher but a goose as well, for New Year’s Day – how decadent! Rob and I invited the family for the feast but then I became concerned that there wouldn’t actually be enough goose to feed all 8 and a half of us as, although geese are large, they have large cavities and not a great amount of meat comparatively. Also I wasn’t sure what size we would get as the butcher could only give us a rough estimate. To guard against this I decided to also cook a chicken, which would also give the added benefit of me being able to offer an alternative if anyone didn’t like the goose. Well I certainly needn’t have worried about the size of the goose – it was a very healthy 6kg – or anyone disliking it, but I am glad I cooked the chicken to bump up the meat offering as there was only just enough goose meat to go round. I thought they went rather well together actually, with the white, lighter chicken contrasting nicely against the dark, richer goose meat. When it came to cooking the goose I pricked it all over to help the delicious fat escape and seasoned it well with salt and pepper. I decided to give it a hot blast for 30 minutes and then cooked it at a lower, but still hot, temperature for another 2 and a half hours. 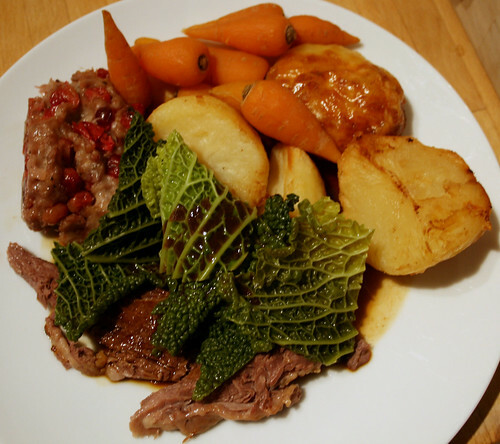 I served it with two stuffings – cranberry and sausage, and sausage, sage and onion – carrots, savoy cabbage and, of course, lots and lots of roast potatoes cooked in all that lovely goose fat which I regularly ladled out of the tray the goose was roasting in. You wouldn’t believe the amount that came out, but I’m not complaining; I still have lots in the fridge destined for more potatoes. The goose was a real winner; everyone liked it. I thought it tasted a bit like a cross between duck and turkey. It was rich but not overpoweringly so, gamey but not too strong and moist but not fatty. I really enjoyed it and it certainly was festive when I brought it out in all its glory. I’m looking forward to cooking one again over the next Christmas period. Make sure both the goose and stuffing are at room temperature before you cook them. If you decide to stuff the goose ensure you add the stuffing to the weight of the goose when calculating how long to cook it for. Make sure the stuffing and goose are completely cooked through before serving. Alternatively cook the stuffing separately, either rolled into balls and put onto a baking tray or put into a small loaf tin, until completely cooked through. To check a goose is cooked through pierce the thickest part of the thigh with a skewer and ensure the juices run clear. Mmmm, goose is definitely the best bird for Christmas. 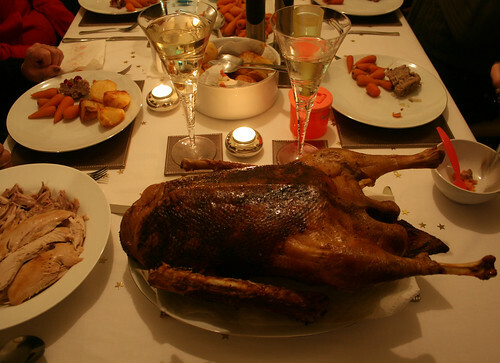 We also had goose for Christmas dinner – it was amazing. We had a 5.6kg bird for the 4 of us, so we had plenty of goose to eat cold with pickles. We had goose for Christmas dinner too as no-one likes Turkey in my family! It was really good, and we even had goose curry the day after! Some day I will pluck up the courage to roast a goose! This looks fantastic! That goose looks amazing! I have always fancied trying it, and now after reading this post I am going to find a good organic butcher and give it a go. My husband is always asking me to cook something new; he’s been asking me to make duck or rabbit! I just can’t bring myself to do it :P, but this goose looks very moist and tender! It’s so cool that you can cook a goose. 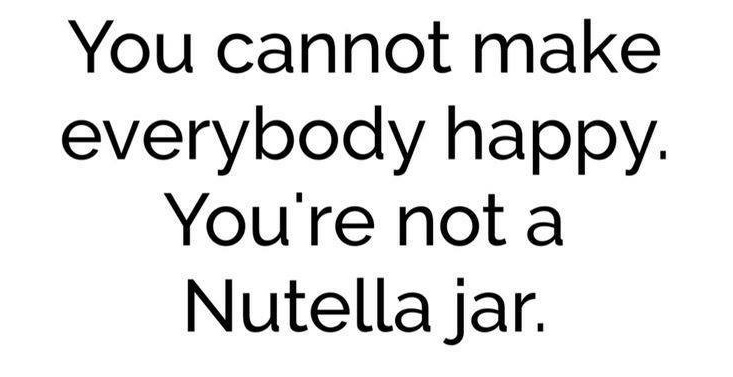 Here in the southern hemisphere, i wouldn’t even know where to find one! I live in Lancashire and I’ve yet to see a goose for sale. Its really obvious your recipes are really TASTY!!! The photos are so tempting!! Goose is magnificent, but what’s maybe even better – if this is possible – are the potatoes you roast around the goose, covered in it’s fat. Oh. My. Goodness. Me.